LEARN at high levels, THINK interdependently, LEAD with character. Maude Rousseau Elementary School was named after C. Maude Rousseau who was a teacher and principal in Lincoln. She was born May 2, 1879 and died February 13, 1961. Miss Rousseau taught at Elliott from 1918-1922. She was an assistant principal and girls advisor at Whittier Junior High from 1922-1926, and was the first principal at Randolph School, where she served from 1926-1947. On March 12, 1963, the board of education approved the name Maude Rousseau for the new school to be built at 33rd and Calvert. At that time, Calvert Street was not even paved all the way. Kingery Construction was low bidder, and thus got the job of building Rousseau School at a cost of under $500,000. The Clark Enersen Partners designed the building. In 1964, Maude Rousseau School’s boundaries started at 27th and Woodsdale, running east of Woodsdale and Melrose to 40th Street, south of 40th Street to the school district’s limits, west to 27th Street and north back to Woodsdale. Additions to building were made in 1968, 1970 & 1997. Currently, the facility has over 70,000 sq. ft. of space. A $4.9 million indoor air quality (IAQ) and renovation project was completed in January 2011 resulting in a new geothermal heat pump system, energy efficient windows, flooring, lighting, secured entrance system, and renovated office, media, and classroom space. 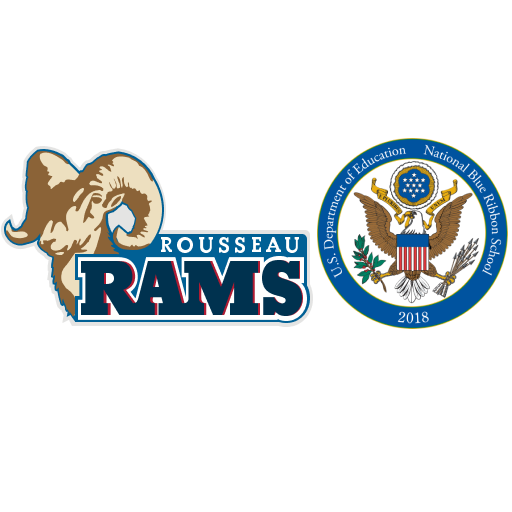 Rousseau Elementary School, with an enrollment of 571 serving students Preschool through fifth grade. We have four sections of classes at each grade. Our classroom teachers, Special Education Staff, as well as our specialist teachers, (art, physical education, media and music) collaborate to meet the needs of our students.